The Republican National Committee is seizing the opportunity presented by the upcoming Supreme Court confirmation battle to energize conservative voters ahead of the 2018 midterms. Only minutes after President Donald Trump announced his nomination of U.S. Appeals Court judge Brett Kavanaugh to replace Justice Anthony Kennedy, the RNC unveiled how it planned to litigate the case for confirmation directly in front of the American public. In its efforts, the RNC is relying on methods that previously proved successful in securing the confirmations of Justice Neal Gorsuch, CIA director Gina Haspel, and Secretary of State Mike Pompeo. The plan, relying heavily on the RNC's extensive field, data, and digital operations, is premised on two phases. 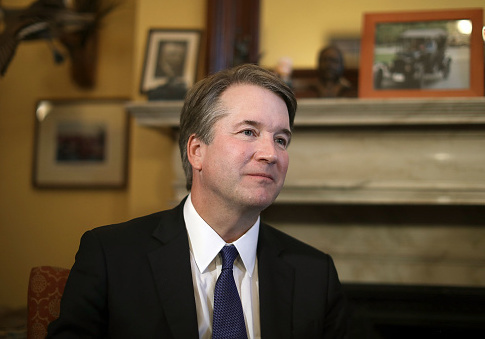 The first, which has already begun, is centered on educating voters to Kavanaugh's judicial record and qualifications. To that end, a significant portion of the RNC's resources will be consigned to pushing back against distortions likely to be made of Kavanaugh's personal and professional life. As exhibited by the recent fight to confirm Haspel, as well as the unsuccessful nomination of Dr. Ronny Jackson to lead the Department of Veterans Affairs, the Democratic Party and outside groups aligned with its interest will play hardball to prevent a nominee's ascendance. The second phase, set to commence two weeks before confirmation hearings start, is focused on mobilizing an organic grassroots effort to pressure red-state Democrats to approve Kavanaugh. In that regard, the RNC has deployed its field program, consisting of 500 paid staffers and 17,000 leadership fellows, to crank up the pressure on vulnerable Democratic senators. Through the targeted placement of op-eds and letters to the editor, SCOTUS specific door canvases, and substantial digital ad buys, the RNC is aiming to reengage traditional elements of the conservative base, for whom the Supreme Court was a top motivating factor in 2016. In a statement obtained by the Washington Free Beacon, RNC chairwoman Ronna Romney McDaniel asserted the GOP would use its field program to take the "confirmation fight directly to voters" and hold Democrat obstructionists "accountable." "We have the largest field program we've ever had, and we're using it to take Judge Kavanaugh's confirmation fight directly to voters," McDaniel said. "If Senate Democrats want to obstruct this immensely qualified judge to appeal to their base, we'll make sure their constituents hold them accountable this November." The RNC's extensive field program, which has already contacted 20 million voters this election cycle, is made possible by the group's large fundraising advantage over its Democratic counterpart. Exit polling from 2016 indicates the RNC has found a winning issue with which to galvanize the conservative base. Of the total Republican vote cast in the last presidential election, approximately a quarter cited the Supreme Court vacancy caused by the death of Justice Antonin Scalia as the "most important factor" for their vote. Regardless if Kavanaugh's nomination is successful, which initial signs seem to indicate it will be, red-state Democrats will be contending with the issue long after the final confirmation vote takes place. Montana state auditor Matt Rosendale, who is challenging Democratic senator Jon Tester this election cycle, told the Free Beacon that he would make the senator's opposition to President Trump's nominees a focal point of the race. "For eight years, Jon Tester stood side by side with President Obama and voted for his judicial nominees 99 percent of the time, including [Justices] Sotomayor and Kagan. Then, when President Trump nominated Neil Gorsuch, he voted against a fellow Westerner who is committed to following the Constitution and protecting our right to bear arms," Rosendale said. "Jon Tester now has to decide; does he side with the far left in Washington or with Montana?" Tester, who was first elected to the Senate in 2008 and has attempted to distinguish himself as a moderate, has consistently voted against President Trump's nominees. Even senators with a more favorable record than Tester's on the issue are not likely to get a pass in November. Mike Braun, the Republican vying to defeat Democratic senator Joe Donnelly in Indiana this cycle, told the Free Beacon that although Donnelly, who voted to confirm Pompeo and Gorsuch, was likely to support Kavanaugh's confirmation, his campaign would attempt to expose the vote as an "election-year" gimmick. "I'm proud to support Judge Kavanaugh's nomination because he is a highly respected and consummately qualified jurist," Braun said. "Senator Donnelly will eventually support the nominee in an attempt to trick Hoosiers into believing he's not a liberal Democrat, but we aren't falling for his election-year pandering." This entry was posted in Politics and tagged Brett Kavanaugh, Democratic Party, Donald Trump, Republican Party, RNC, Senate, Senate Democrats, Supreme Court. Bookmark the permalink.